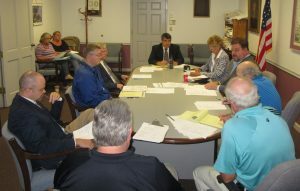 Participants in the Wyoming County Prison Board meeting on Aug. 21 included (clockwise from back, left) commissioners Judy Mead, Tom Henry, and Ron Williams; chief clerk Bill Gaylord; sheriff Ned Sherman; district attorney Jeff Mitchell; warden Ken Repsher; judge Russell Shurtleff; and solicitor Paul Litwin. The board regretfully accepted the resignation of Matthew Landsiedel but wished him luck on his new job as a teacher and the promotion of Gene Bulman and Logan Dickinson from part-time to full-time corrections officers. Inmate intakes outnumbered releases by 10 last month, with 86 currently incarcerated at Tunkhannock, nine at other prisons, and three assigned to rehabilitation facilities.